Another busy week has seen Italian shipbuilder Fincantieri reach a record number of orders, fuelling strong sentiment in the Italian yard sector. A fresh batch of deals from TUI Cruises and Norwegian Cruise Line (NCL) means the country’s largest shipyard group now has a cruiseship backlog stretching through most of the next decade. The Trieste-headquartered group now has 80 ships on order from different sectors for more than nine million cgt. That compares with 4.2 million cgt at the end of 2007 — the year with the highest number of orders before the financial crisis. Vincenzo Petrone, chairman of Italian shipbuilders association Assonave, believes the shipbuilder has weathered the impact of the global shipbuilding crisis. Speaking after Assonave’s annual meeting in Rome recently, Petrone said the shipbuilding sector is showing the first signs of recovery after a 20-year low in 2016. He added that recovery remains patchy, with some sectors of shipping, such as the offshore market, at a standstill. Therefore, last year was “a year of selective recovery”, he said. But the cruiseship industry — where Italian yards specialise — remains in excellent shape. Through a strategic focus on cruise, naval and other niche sectors, Italian shipbuilders had stayed “in the right part of the market”, Petrone said. They had avoided building in sectors that had suffered from overproduction, which had led to some yards in Asia resorting to “a dangerous dumping policy”. Global newbuilding orders totalled 21 million cgt last year. 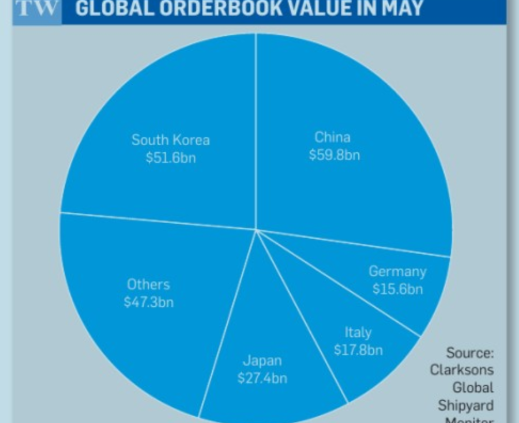 With 3.6 million cgt on their books, European shipbuilders held just 17% of the market share — just over half that of their Chinese and South Korean counterparts. But, measured in dollar value terms, the European yards are top of the ranking. 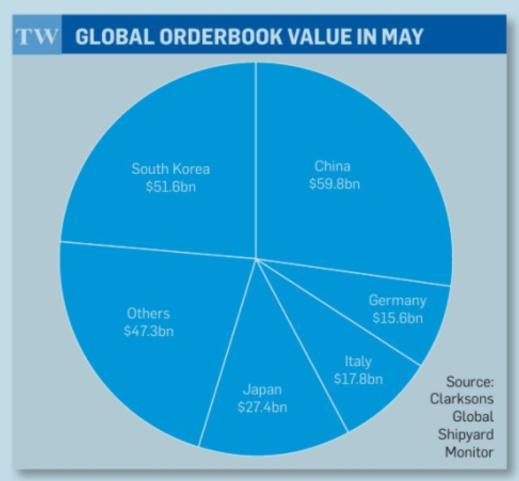 Figures from Clarksons show the European shipbuilders’ portfolio of orders for commercial ships in May put them in first place with $64.5bn. They are followed by China with $59.8bn, South Korea with $51.6bn and Japan with $27.4bn. The European portfolio seems to have been buoyed by increasing cruiseship orders. Earlier this month, Fincantieri bagged an innovative construction contract for two 161,000-gt LNG-powered vessels to be built for Hamburg-based TUI Cruises, which is 50% owned by Royal Caribbean Cruises. These new vessels — the largest to be built in Italy — will be constructed at Monfalcone shipyard and delivered in 2024 and 2026. This order was placed shortly after NCL exercised options worth $1.9bn for two more cruiseships for delivery in 2026 and 2027. The Leonardo-class ships are the fifth and sixth in a series of 140,000-gt vessels that will accommodate 3,300 passengers. Fincantieri chief executive Giuseppe Bono said they “would further extend the workload horizons of our shipyards”. These vessels add to Fincantieri’s backlog of orders, which in early May stood at €27.7bn ($32.4bn), or just 5.5 years of work. At that stage, its orderbook comprised 27 cruise vessels, 31 naval ships and 46 offshore units. Petrone said 2017 was “a golden year” for the cruise sector. This is reflected in the high number of newbuilding orders, with 23 ships of more than 10,000 cgt ordered, compared with 25 in 2016. Now that Italian yards have emerged unscathed from the shipping crisis, Petrone said they have to meet the challenges of an exceptionally heavy workload by maximising their competitiveness. He urged European shipbuilding lobbies to “dedicate political attention and financial resources to maintain and further develop research and investment in our industry to preserve global leadership”.